Over the past year, we’ve been examining the National Park Service in the context of its 100th anniversary. We considered whether the NPS should expand its “brand“; looked at the history of Mission 66; evaluated the idea of certain parks being “crown jewels”; and argued for a more nuanced understanding of the NPS’ recent post World War II history. We’ve also been compiling a list of key documents and reports for thinking about the future of the agency. Here are five that are worth taking a look at as the centennial winds down. Scaling Up – In the years leading up to the 2016 centennial, the NPS released a Call to Action, which included “Scaling Up,” or embracing a collaborative approach to large landscape to conservation, as #22. The report linked here highlights efforts already underway across the NPS system and in affiliated areas that seek to protect diverse resources through partnerships. Imperiled Promise: The State of History in the National Park Service – Released in 2012 by the Organization of American Historians, the report examines the practice of history (broadly defined) in the National Park Service. This is an important issue, considering that 2/3 of NPS units are considered historic sites of one type or another, with the remaining natural parks also home to rich stories of the past. Among many important recommendations, the study suggested park units look beyond their boundaries in order to tell richer, more nuanced, multi-layered narratives. Second Century Report – Published in 2009, the report, entitled “Advancing the National Park Idea,” was a product of a year’s worth of meetings and research conducted under the auspices of the Second Century Commission, a group of scientists, historians, business people, conservationists, educators and more convened by the National Parks Conservation Association. 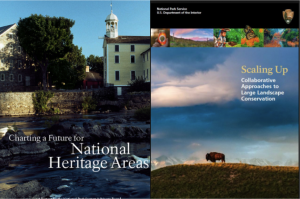 Charting a Future for National Heritage Areas – Published in 2006 by the National Park System Advisory Board, Charting a Future offered one of the most detailed analyses of the NHA system-to-date. Among other recommendations, it called for research on the workings of collaborative conservation at a landscape scale. The Vail Agenda – Published in 1992, the Vail Agenda grew out of a public meeting held in 1991 in Vail, Colorado. Intended as a forum for the consideration of the Agency’s future on the occasion of its 75th anniversary, the report’s recommendations, now a quarter of a century old, are interesting to consider in the context of the centennial. The e-library of the NPS also has a thorough listing of key documents from the Agency’s history available to download here.